There is a former prime minister named Sir Wilfrid Laurier on Canada's five dollar bill and since Leonard Nimoy's death, the bills have been marked up - to look like Spock from Star Trek! The resemblance is uncanny with just a few pen strokes. It's been happening quite often. It's perfect during this 50th anniversary of Star Trek, too. That image at the top is Sir Wilfrid in the un-touched bill and of course a Spockified bill is below it. According to Bank of Canada it's not illegal to do this "...However, there are important reasons why it should not be done. Writing on a bank note may interfere with the security features and reduces its lifespan. Markings on a note may also prevent it from being accepted in a transaction. Furthermore, the Bank of Canada feels that writing and markings on bank notes are inappropriate as they are a symbol of our country and a source of national pride." I am surprised they are circulating, if I received one, I think I would save it and not spend it. 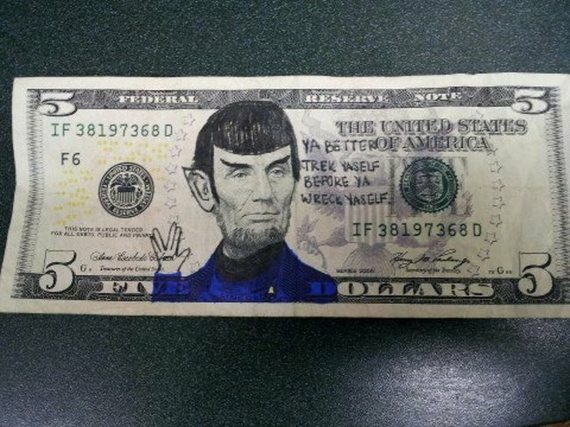 But as you can see above, there's a US $5 bill circulating with Lincoln made into Spock, guess that's how Lincoln would look if he was Spock for Halloween.